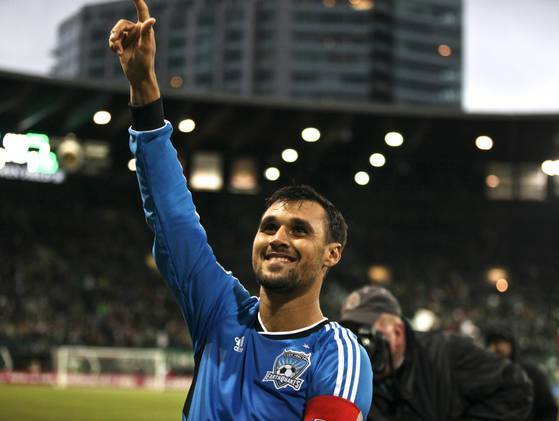 A special night in Portland last night … for the opponent’s hometown Bay Area man Chris Wondolowski who battled from the oblivion of the US soccer hemisphere to finally land time at the San Jos Earthquakes added him name to MLS lore. A rotund 27 goals on the season for the San Jose striker; his final effort of the regular season coming on a penalty kick. Wondolowski ties the TV man Roy Lassiter for the MLS all-time season goal record. What the frig is Mark Clattenburgh doing other than putting on the Fergie? The Torres red is inexplicable….not even any words. Apologies to Wondolowski and the writer for stepping on his moment in the sun. Words above obviously written in the red mist of that awfully reffed mess. How can a ref watch that play and decide that the right thing to do for two teams playing for the top spot in the league is to send off a forward who avoids another Jonny Evans two footed leg breaker. And he caught him and never touched the ball!….never mind that the Little Pea-nis comes from inside the goal to redirect a ball and the isn’t a sniff of offsides. Just awful decisions. Ivanovic had to go off no argument but to pull a 2nd yellow on that type of play is just doesn’t pass the smell test for me…. Hyndman’s hatred of youth is ridiculous. Not only are there no homegrown players in the starting lineup, there’s none on the bench either. A huge disconnect between the front office and the coach. Bizarre that this is continuing. Congrats to Wondo. I’m most pleased that it wasn’t a foreign DP signing that equaled the record. It says so much more about the progress of MLS that Wondo did it instead of Henry (et all). Remarkable achievement from Wondo. Couldn’t happen to a nicer guy, it seems. Lassiter set the record in the first year of the league when MLS defenses were much softer. Wondo’s rise over the last 3 years is nothing short of remarkable. However, I do feel that Kenny Cooper, scored 18 for the second time in his MLS career, isn’t getting enough respect. 18 is an excellent acheivement, and he did it this year with far less shots than in 2008 with FC Dallas. He also got called offside far less often this year. steve, im sorry, but wondo had a chance to make the single season scoring record his own, but since he did not, it seems fair to set him on a pedestal, not above, but next to roy lassiter.